Optimal choice for professional training and amateur to semi-Pro racers who ride all types of terrain and demand performance lap after lap especially under "race simulation"
FRONT KNOBS: arrow-like layout and side knobs for directional accuracy and straightaway visibility; V-shaped knobs improve braking stability and cornering side hold. REAR KNOBS: maximum traction on all terrain applications. Surface area and compound’s carbon black structure for balance between stiffness, reliability and lasting performance. Grip and traction on a wide range of terrain (from mid soft to mid hard). 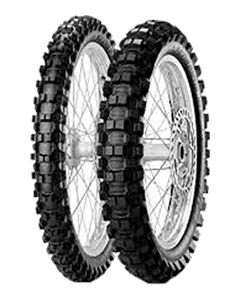 Tread pattern taken from previous design with the rear’s layout rigidity improved through “bridges” and a new front similar to the Scorpion MX Soft 410. Multi-ply carcass with high resistance to punctures but maximum flexibility to absorb forces during jumps or obstacles.